Selfies. Photo-ops. Instagram walls. We’ve all heard of these moments and have been on the lookout for opportunities in our everyday experiences. As our lives become more digitally connected with social media apps such as Instagram, Snapchat, and Facebook, there is not a moment we spend uninterrupted by the desire to post something unique or exciting. This leads to an ever-growing demand for photo opportunities to share. The concept of “selfie walls” has been around for years, but with their growing popularity they have begun to evolve and take on a life of their own. What once used to be a process of discovery and repurpose has now become a monetized business adopted by retail, restaurant, charity groups, and more. These “selfie walls” have captured the attention of companies as a marketing tool. Years ago, businesses, street artists, and others created murals as a way to express and share ideas with the community. There was never a purpose behind mural art as content to be marketed or shared on a large scale, it was just part of the environment. Over the years, people started looking for substance to share on social media, and backgrounds to take pictures or interact with. This trend became so popular that cities like Austin and Houston have become known for their “selfie walls,” and tourists make an effort to capture them. On the business side, the attraction and demand for these moments is very apparent, and an innovative way to market a brand. By creating an experience for customers or tourists, these curated “selfie walls” are giving businesses extensive publicity over a vast social media network, allowing brands to be shared and mentioned at a global scale, for free. This potential digital reach creates a demand for the wall and a plethora of new customers and visitors. LinkedIn does a great job at curating fun, interactive moments within their workplace for employees or visitors to share, as evidenced in LinkedIn’s Silicon Valley headquarters and the tech company’s Chicago office. 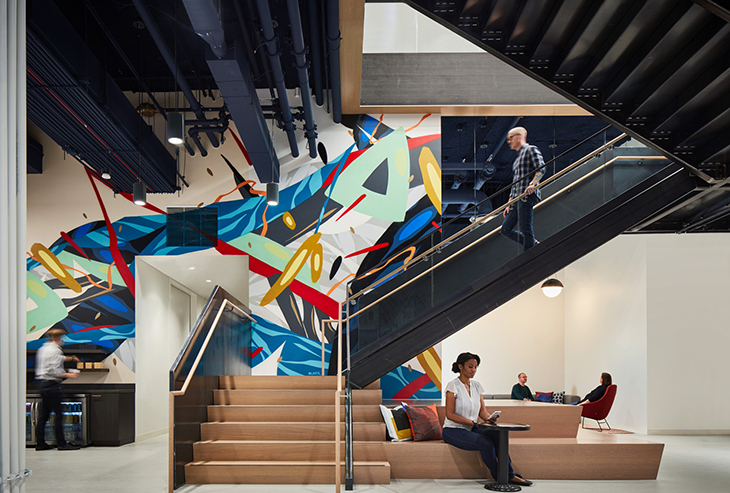 Interactive environmental graphics and murals throughout LinkedIn Chicago’s expanded offices are used to communicate the company mission and values, as well as a way to inspire, elevate, and spark joy. Photo by Tom Harris. A strong concept and execution of the experience, plus a smart and easily accessible location, is ideal for designing the selfie moment. It’s important to make sure these walls are not hindering the everyday workings of the business. Be mindful of not causing jams in flow, while making the environment visible and easy to use. The more interaction that can be designed into the wall, and the more dramatic and unique the design, the more attention it will draw from the consumer. Creating walls that offer flexibility to the design allows for the experience to be shared again and again in new ways while keeping the art fresh. Thoughtful consideration about how to brand these moments will contribute to their success; just placing a logo on a wall is not going to cut it. Murals and street art are examples of storytelling that can be channeled into any design experience to represent a brand. Make it feel accidental, artsy, or fun. Focus on the experience, interaction, and story, and let social marketing benefits come second. Playful signage within CoolMess Ice Cream Parlor in New York City includes a wall of photos taken by customers in the space—encouraging guests to take and post their own photos to continue the fun. Photo by Chris Leonard. It’s important to keep in mind the effect that physical spaces have on their occupants. Part of this is visualizing how the average patron navigates through the space and why certain features may become photographic opportunities. From the moment they enter the space, and through every turn they make, until the moment they leave the property, moments of “shareability” can be all around them. Consider how an ornate entrance door, unique floor tile, bold light fixtures, green live walls, funny restroom signs, or edgy exterior murals can all be image backdrops for a great “selfie.” We are all in the business of making memories, but photos are the trustworthy place where we keep them.